I have a friend who lives in Malawi. Her name is Tamala, and she’s 7. She became my friend after I sat through a banquet listening to a heart-wrenching story by a famous Canadian who works tirelessly to raise awareness about AIDS and the plight of the impoverished African children. He spoke of a little girl, who when asked what she wanted, anything at all, she burst into tears. She was so terribly upset because she didn’t have a pencil to write an exam the following day. He went on to explain that she didn’t have a pencil because she had lost her family to AIDS and the ones caring for her couldn’t or wouldn’t provide her with a pencil. I won’t even attempt to do the story justice, suffice it to say there wasn’t a dry eye in the room, and I felt like the biggest heel on the planet – stuffed to the gills from my fancy lunch, 2 desserts waiting on the table in front of me, and a neat little stash of pens that seemed to glare up at me and call me awful names. The story of the little girl broke my heart, and that night I sponsored a “hope child” meaning her life has been impacted by AIDS, and needed a bit of hope. That story too inspired a little urge within me – to go check out this Africa place, and see what it’s all about. Like my two desserts, it was entirely a selfish undertaking. 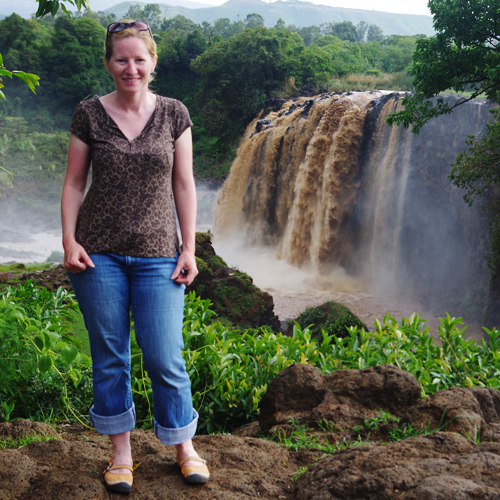 Many people say that visiting Africa changes your life, and I was more than ready to shake my life up a bit. I was a little nervous about what I’d see – after all, the tv commercials would have me believe that the children there are all famished, filled with despair and covered with flies. Could my heart handle it? The majority of my little African adventure took place in Tanzania. We trekked through villages in the Usambara mountains, stopping to stay in a convent, visit a women’s pottery project, and learn about soil conservation initiatives. All very incredible – but the most astounding thing of all were the children. So vibrant, full of life, smiling, giggling and singing. As we walked from village to village, shouts of “jambo!” followed us, the swahili word for hello. Through the towns we were welcomed every step of the way – “jambo, karibu!” Children would run up and join us for a while on our walk – giggling as we snapped a photo or two, quick to give us a high five. We stopped in to visit a school – 900 students, 11 teachers. Could you imagine, one classroom of 100 5 year olds, the mayhem? It wasn’t like that at all – they squeezed into their desks, often shared by 2 or 3 others, and sang a song to welcome us, and show us how well they can count. In another classroom of older students, we quizzed them, ‘what do you want to be when you grow up?’ A nurse, a pilot, a lawyer, a doctor! Of course. Without a doubt – there were no flies at all on these kids, just a smile and an eager spirit. It left me wondering – while I have no doubt at all that there is a need in those tiny mountain villages, why the image of devastated children is perpetuated. I was so inspired by their sense of hope, their willing to share, their desire to learn. I wonder if we showed the world that this version of “hope children” exist, if we’d be as willing to lend a hand. I’d like to think so. We met two little girls in a small town on Zanzibar. They ran out to greet us as we walked into town. A cheerful “jambo,” a high five and a bunch of giggles. My friend and I walked along with these young girls for a bit – the one walking with my friend had a coconut shell with a few peanuts in it, and offered my friend a peanut. The girl I was walking with stopped for a second – she didn’t have any peanuts in her hand. In an instant, she smiled, plucked the peanut out of her mouth and handed it to me. She gave me everything she had, with a smile, without hesitation. She broke my heart and made my day all at once. I came home from Africa entirely humbled. I had been welcomed into homes of people who had almost nothing and watched them shine while they told me about their families and their villages. I had bought fruit from their grocery stores that are the size of my small closet. They had so little yet, they were so warm, kind and happy. And I can’t help but think that while we in the west like to think we have it all figured out, maybe we have miles to learn about what really matters, or at least how to measure what makes our days worthwhile. Perhaps we are the ones that have flies on us – as we sit in front of our tvs watching the latest reality show, maybe we are the ones that are malnourished as we eat some more potato chips, and maybe we are the ones that need a bit more joy in our lives as we ponder what to buy next at the mall. Either way, I’m sending more pencils to Africa.